Autumn, particularly early on is a difficult time. Just too hot for the full roast but too cold for another Sunday barbecue so what do you serve? 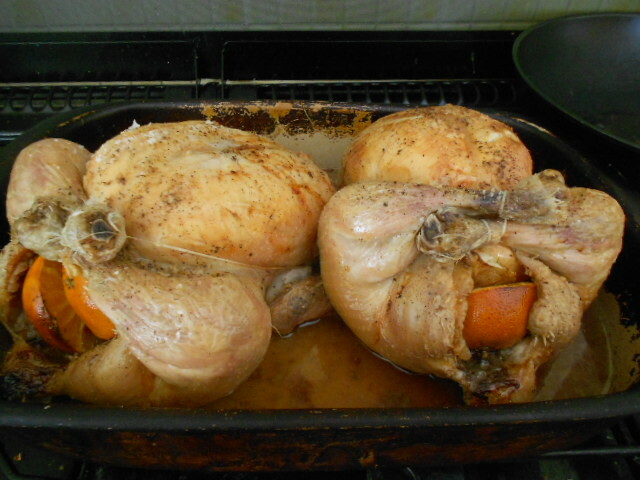 Having planned according to the weather forecast I was doing a roast dinner. The day turned out to be far too hot and we ended up have an extra four people so this went down very well. Stuff the chickens with the Oranges, onions and cranberries. I used four oranges so put two halves in then the onions and then finished with the other two oranges. I did use pepper and salt over the skin before cooking. 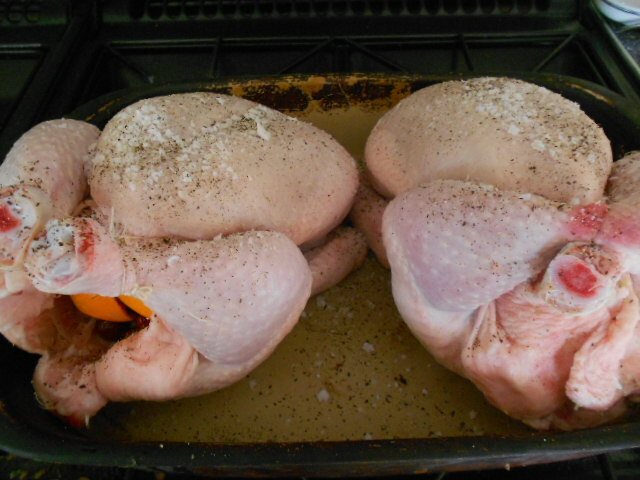 Roast these according to your normal cooking process, removing them when they are brown and crispy on top. In to a bowl carve the chicken, or pick it to bits keeping the legs and wings separate. 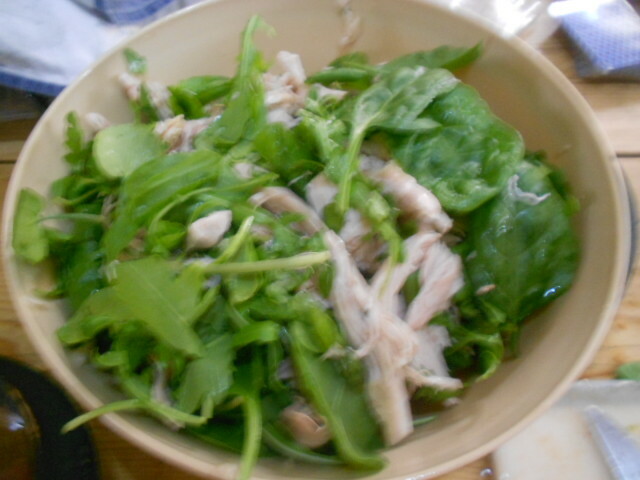 Add the salad to the chicken bowl and mix well with hands. 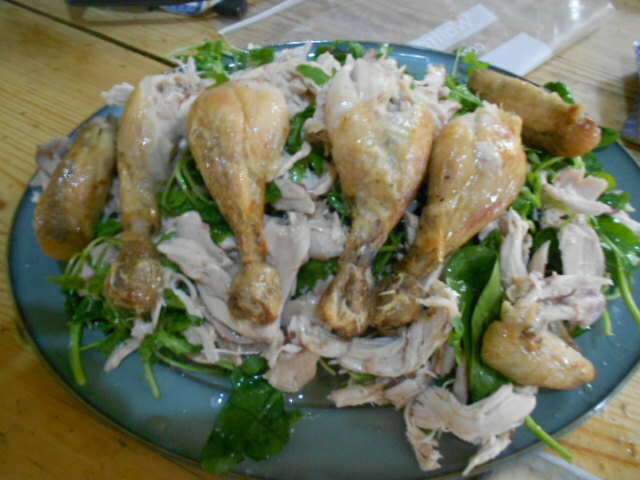 The heat of the chicken allows the salad to begin to wilt. Taking out the oranges, squeeze any remaining juice from them into the roasting dish. 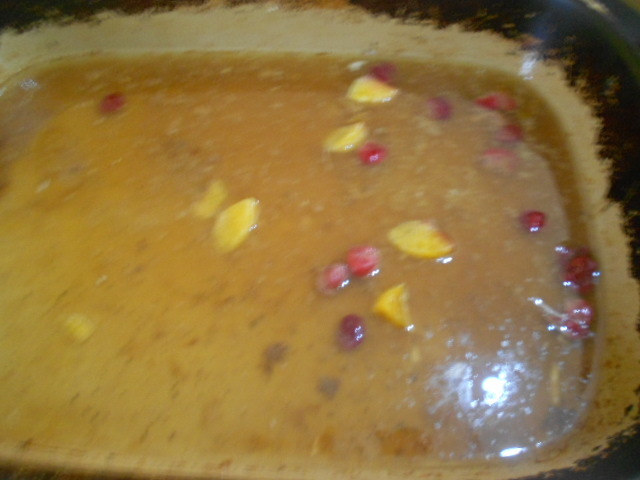 Let any cranberries fall into the dish. Pour some of the juices over making sure all the cranberries are used. (This is when I would add the pomegranates if using). Arrange on serving platter and then add the reserved legs and wings on top. Serve with buttery minted new potatoes and a warm bean salad. Enjoy and let me know what different combinations you come up with.